At the outset, all are appealed to pardon me for starting most of my articles with two or four lines of a song and also ending-up with similar fashion, since I am an inflexible & unrefined Music Lover, I could not able to obstruct myself from doing so. By remembering this one the best title song of Hindi Film Music from PHIR WOHI DIL LAYA HOON in the harmonious voice of Mohammed Rafi, I hereby take permission of all Music Lovers to invite them to the tiny chapter of the light & comic romantic songs of 1960s. In late 1950s, Producer Sashadhar Mukherjee wanted to start a new film with debut-making director R K Nayyar, who had assisted Raj Kapoor. Joy was not the first choice for the film and many newcomers including Dharmandra were considered for the venture, but director R K Nayyar noticed producer Mukherjee’s young son Joy, a BA Final year student who was singed for the film. In this romantic comedy, Joy played the role of DEV, a bachelor who concurrently fall in love with two cousin sisters, played by AZRA & SADHANA. In the film, simple Sadhana renovates into a slim shower to compete with her traditionally beautiful cousin Azra and for Joy’s fondness. Mohammad Rafi sang some lilting songs for Joy in the film. The film had 11 songs composed by Iqbal Qurashi in the lyrics of Rajinder Krishan out of which 10 songs to the credit of Rafi Sahab. The film was a big hit and Joy became a romantic star with his very first film. During shooting of Love In Shimla, a real life love story was also started, Director R K Nayyar and Sadhana fell in love, her parents filed a legal case against Director Nayyar, since Sadhna was under 18 at that time. 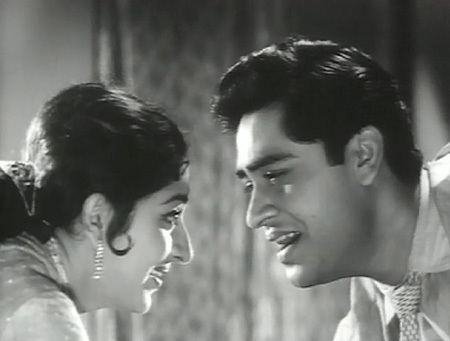 After her success in films, her mother strongly disapproved Nayyar as Sadhana’s boy friend and advised her to marry someone like Rajendra Kumar. But in 1965, with intervention by Raj Kapoor and supported by her father, Sadhana married RK Nayyar. Later on, R K Nayyar directed Joy Mukherjee in two more films: Aao Pyaar Karen (1964) and Yeh Zindegi Kitni Haseen Hai (1966) with Saira Banu where Rafi Saheb also the voice of Joy. This second top super hit film of the year was produced by Sashadhar Mukherjee and directed by Raj Khosla starring Joy Mukherjee, Sadhana and Rajendranath. Rafi Saheb sung all the songs of the film for Joy under musical mixture of O.P. Nayyar in the poetry of S.H. Bihari, Raja Mehdi Ali Khan & Shevan Rizvi. The songs are: the Rafi solos, “Mujhe Dekhkar Aap Ka Muskurana, Mohabbat Nahin Hai Tu Phir Aur Kiya Hain”, “Bahut Shukriya Badi Meharbani, Meri Zendagi Mein Huzoor Aap Aaye”, “Hum Ko Tumhare Ishq Ne”, “Phir Tere Shahar Mein, Phir Wohi Dil Laya Hoon” and the Rafi-Asha Bhosle duets, “Aap Yunhi Agar Humse Milte Rahe, Tu Dekhiyee Ek Din Pyar Ho Jayeega”, “Main Pyar Ka Rahi Hoon, Teri Zulfoon Ke Chayye Mein Kuch Der Thehar Jayoon”, “Tumhen Mohabbat Hai Humse Mana”, “Zubane Yaar Man Turki” were well picturised on Joy & Sadhana. This song-studded romantic love story was a second production of Nasir Hussain after Jab Pyar Kisi Se Hota Hai, also being written and directed by him starring Joy Mukherjee, Asha Parekh, Pran & Rajendranath. The film contains many beautiful songs of Mohammad Rafi under musical score by O.P. Nayyar in the lyrics of Majrooh Sultanpuri. The Rafi solos, “Banda Parwar Tham Loo Jigar”, “Lakhon Hain Nigahon Mein, Zindegi Ke Rahoon Mein”, “Aanchal Mein Saja Lena Kaliyaan”, “Aji Qibla, Mohtarma, Kabhi Shola, Kabhi Nagma” and Rafi-Asha Bhosle duets, “O Hamdam Mere Khel Na Jaano Chaahat Ke Iqraar Ko”, “Zulfoon Ki Chhaon Mein Chehre Ka Ujaalaa Lekar” were big hits. The other hit songs of the film are “Dekho Bijli Dole Bin Badal Ki” sung by Asha Bhosle & Usha Mangeshkar and “Mujhe Pyar Mein” sung by Asha Bhosle. This first colour movie of Joy was a silver jubilee hit and became symbolic of Joy’s image. A Subodh Mukherjee film directed by Samir Ganguly, starring Joy Mukherjee, Saira Banu and I.S. Johar. In the film, Rafi Sahab echoed very beautifully for Joy in the songs like “Bade Miyan Deewane, Aise Na Bano Hasena Kiya Sahe Humse Suno” with I.S. Johar, the Rock-N-Role “Duniya Pagal Hai, Ya Phir Main Deewana, Mujko Chahat Hai Zulfoon Mein Yulzana” in a Shammi Kapoor manner and the duet with Lata “Woh Hain Zara Khafa Khafa”. In this golden jubilee hit, Joy showed a well stylishness comedy as a lover boy of village belle Saira Banu and love guru of Professor I.S. Johar which in fact was the last successful film of lover boy Joy. In addition to above landmark films, Rafi Saheb also harmonic for Joy Mukherjee in many films like Ummeed (1962), Ziddi (1964), Ji Chahta Hai (1964), Ishara(1964), Door Ki Awaaz (1964), Aao Pyaar Karen (1964), Saaz Aur Awaaz (1966), Yeh Zindegi Kitni Haseen Hai (1966), Ek Kali Muskai (1968), Ehsan (1970) and Love In Bombay(1975). AAO PYAAR KAREN, a romantic drama directed by R K Nayyar starring Joy Mukherjee, Saira Banu & Sanjeev Kumar, had good number of Rafi gems composed by Usha Khanna. The solos, “Dil Ke Aaine Mein Tasveer Rehti Hai”, “Jinke Liye Main Deewana Bana”, and the duet, “Tum Akele Tu Kabhi” by Rafi-Usha Khanna were picturised on Joy & Saira Banu. SAAZ AUR AWAAZ, a film directed by Subodh Mukherjee had some classic number of Rafi gems composed by Naushad: the solos, “Saaz Ho Tum Awaaz Hoon Main”, “Dil Ki Mehfil Saji Hai” by Rafi and the duets, “Tum Ishq Ki Mehfil Ho”, “Aa Pyar Raah Bahaar” by Rafi-Asha Bhosle & “Aa Ji Kisne Mujhe Sada Di Kisne Mujhe Pukara” by Rafi-Suman Kalyanpur and the songs were picturised on Joy & Saira Banu. The other notable Rafi solos, “Mujhay Ishq Hai Tujhe Se, Meri Jann-E-Zindegani, Tere Pass Mera Dil Hai Mere Pyar Ki Nissani “ from UMMEED was picturised on Joy & Nanda, “Kiya Kehney Mash Allah Nazar Teer Aap Ki, Ji Chahta Hai Khisloon Tasveer Aap Ki” from JI CHAHTA HAI was picturised on Joy & Rajshree, “Dil Beqarar Sa Hai” & “Hey Abdullah Nagin Wala Aa Gaya” from ISHARA were picturised on Joy & Vyjayantimala, “Yeh Zindegi Kitni Haseen Hai” & “Jawan Ho Mashallah” from YEH ZINDEGI KITNI HASEEN HAI were picturised on Joy & Saira Banu, “Lo Ek Kali Muskaee” & “Zulf Bikhrati Chali Aayee Ho” from EK KALI MUSKAI were picturised on Joy & Meera. The song from Devendra Goel’s film DOOR KI AWAAZ, “Hum Bhi Agar Bachche Hote, Naam Hamara Hota Dabloo Babloo, Khane Ko Milta Laddoo, Aur Duniya Kehti Happy Birthday To You” is the most remarkable birthday & children song of Hindi Film Music and this multi-singer song was sung by Mohd. Rafi for Joy, Asha Bhosle for Saira Banu and Manna Dey for Om Prakash composed by Ravi in the lyrics of Shakeel Badayuni. 2 1962 Ek Musafir Ek Haseena Main Pyar Ka Rahi Hoon O. P.
The duet, “Kahan Chali Zara Ruk Ja Ruk Ja” by Rafi-Kishore from LOVE IN BOMBAY is the last song picturised on Joy Mukherjee composed by Shankar in the lyrics of Majrooh Sultanpuri. It was a polite romantic song tremendously sung by Rafi Saheb, but exhausted to some extent due to unfortunate picturisation. The best lines of the song, “Waqt Insaan Pe Aisa Bhi Kabhi Atta Hai, Rah Mein Chorke Saaya Bhi Chala Jaata Hai“ (There are be occasions in person’s life when even his shadow deserts him) and the said lines became best manifesto of the later careers of both Joy Mukherjee and O. P. Nayyar. In turn of the decade, Joy Mukherjee films like EHSAAN, MUJRIM, PURASKAR, KAHIN AAR KAHIN PAAR all in 1970s was unsuccessful and EK BAAR MUSKURA DO (1972) was a moderate success due to melodious music by O.P. Nayyar. Again, Joy directed LOVE IN BOMBAY (1974) with self & Waheeda Rehman and CHHAILA BABU (1977) with Rajesh Khanna & Zeenat Aman, but not able to rejuvenate his career as an actor or director without any signature tune of Mohammad Rafi. However, the song, “Yaar Dildar Tujhe Kaisa Chahiye, Pyar Chahiye Ya Tujhe Paisa Chahiye” from Chhaila Babu was became popular among music lovers. Joy was last seen in the film HAIWAN (1977) with his real life brother Deb Mukherjee. Joy Mukherjee was never judged as best of actors, but his boyish good looking tall figure with Western clothes made him a beloved with female fans. All through his career, his popularity was supported by the echoing songs sung by Mohammad Rafi and for a few years in the 1960s, he was one of the romantic kings of Hindi Films with films like LOVE IN SHIMLA (1960), PHIR WOHI DIL LAYA HOON (1963), LOVE IN TOKYO (1967), and SHAGRID (1967). He was mostly romanced with top heroines of 60s like SADHANA (Love in Shimla, Ek Musafir Ek Haseena ), ASHA PAREKH ( Phir Wohi Dil Laya Hoon, Ziddi, Love in Tokoyo), SAIRA BANU ( Door Ki Awaaz, Aao Pyar Kare, Saaz Aur Awaaz, Yeh Zindagi Kitni Haseen Hain, Shagird ) and SHARMILA TAGORE ( Dil Aur Mohabbat, Humsaya). He will always be remembered as a Rafi influential hero and COMIC LOVER BOY of the sixties. This entry was posted on Sunday, July 19th, 2009 at 8:57 pm	and is filed under Meri Awaaz Suno. You can follow any responses to this entry through the RSS 2.0 feed. You can leave a response, or trackback from your own site. Even though Joy Mukerjee’s uncle was Kishore Kumar. Joy Mukerjee made no secret of the fact that his favourite singer was Mohd Rafi saheb not only that with his family releasing the film ‘Love in Bombay’ recently his wife said that even though Kishore kumar is in the film and is her husbands uncle her personal favourite is Mohd Rafi saheb and you just can’t beat him. That just goes to show the greatness of this man. It is great loss ! Within two days two legend Ravi Music Director and Actor Joy Mukerjee died. His memory always remain in hearts through their lovely songs. Every Rafi fans known both are great voice of Rafi Saheb. We miss you both ! If I were to author a book on the legend of all time, I shall run out of words. I dare not venture to describe the gems of rafi sahib. I am a tiny drop to write about this great singer, a gentleman par excellence in all forms and manifestations. Allah took him away from us. He could be spared but Allah was in love with him. I am a passionate listener since my boyhood. I have so much of respect for him like millions around the world. One can read the impeccable beauty in his innocent smile. Every hears millions around the world recalls him profoundly on his death anniversary let the word give this singer one more salute for his gem of qualities. The greatest singer of all time is a legend beyond expression. He was a gift of God. hew as human being being par excellence, a singer, a philanthropist. he will live in the hearts of millions until eternity with respect and love. he died young at the call of the Almighty. His smile was as innocent asa morning dew, his love for human being were as fresh as flowers. I love listening to his immortal songs. India has produced hundreds of great singers, but the like of Rafi sahib was a rarity. he was impeccable, unbeatable, yet humble and gentle asa lamb. God rest hi soul peace. My respect knows no bound. aaj ek baar phir wohi maqaam aaya hai jisse guzarna hamaray dilon pe khanjar chalne se kam nahi, wohi manhoos 31 july,wohi din jis ne hum se hamare sooraj ko chheen liya aur music ki duniya mein taareeki phailadi. sach kahoon to ab mausiqui ki duniya mein sewa andheron ke aur kuchh bhi nahi aise mein kuchh hai to is andheron ke parde ko chheerti hui wohi noorani aawaz hai jo aaj bhi apne naghmon ke zaria hamare dilon ke andhere door kar rahi hai. kaash aisa ho paata ke allah hum jaise chund logon ki zindagi ke aiyyaam bhi rafi saheb ki zindagi mein jod deta,to aaj hum uss farishte uss aawaz ke khuda se mahroom to na hotay. naghmon ka safar to aaj bhi jaari hai, lekin woh raah-numa ab kahan?? aayen hum sab uss paak rooh ki taskeen ke liye milkar dua karen kyun ke ab hamare haathon mein sewa dua karne ke aur kuchh bhi nahi jo us shakhs ko nazar kar saken. does anyone of few good websites that have mohd rafi songs availabale for download. i would appreciate any feedback in this regards. yes it is true , we are remember joy as a lover boy with his goodluck rafi saab. rafi saab & joy mukharji evergreen in our heart. I am a die heart fan of Rafi g and this is great topic on his best compostion…….I can not live without rafi sir song ……He sang all the song by heart …….A great singer and great human being………..He will be always alive in our heart……. wah !JAWAID NASEEM ji,,,great,,,wo sakhs jis se hamara bhi ek rista thha,,,,aur hai,,,Rafi,,,really,,very nice n touching! jab kabhi bhi sunengay geet tere…. THIS SUNDAY again ( 26th July ) Morning 9 am watch ace composer ravi sharma talking about mohd rafi. the serial on mohd rafi ends first week of august. ravi sharma is bombay ravi to music lovers from kerala. in hindi films he is just ravi. bombay ravi has given music to about 17 mal. movies. he introduced chithra in malayalam and her first song got many awards . ( manchal prasadaaoom nettil chaarti ). plus he has some kohinoor geets in malayalam in the silky voices of yesudas. if some of them could be up-loaded here, it would have been wonderful. so tune in on sunday morning to kairali tv 9.00 am for a mohd rafi special. Excellent information. i really admired your notes of information. we did now little about joy mukherjee in relation to Rafi sab’s song. i’m re affirmed once a gain that rafi ji’s song made careers of some the much talked about film actors during his time. the song ‘ suno suno miss chattrejee was picturised on johny walker for the movie ‘ baharein phir bhi ayengi ‘ & the song ‘ teri patli qamar ‘ was picturised on mehmood. Dilip sahab has a very feeble voice. Some times we cant listen to the end of his romantic dialogues. The song ‘ Ai mere dil kaheen aur chal by Talat sahab exactly suits dilip sahab’s voice. Of course its all the decission of the music directors only. For example in Usne kahaa tha Salil Chowdhury sahab & Ek phool char kantey Shankar- jaikishen ji have used Talat sahab’s voice for sunil dutt ji, where as rafi sahab suits excatly to sunil dutt ji’s voice. We can only feel but the decision of the music directors is final as far as the scale, melody, availability of the singer are concerned. Infact most Joy Mukherjee films are musically hits. My personal favouriate of all the Joy Mukherjee films are “Ek Musafir Ek Hasina” and “Love in Tokyo”, espeacially the song “Edhar Aa Bhi Jaa”. I was born in Singapore and have been listening and collecting Rafi’s songs. I have hundreds of cassettes and cd’s. 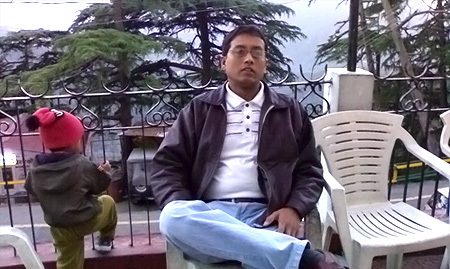 I will be in Bombay from 5th to 12 September and in Chandigarh from 19 to 31 December. I want to meet you people. Nice to read your comments on the xlnt & detailed article of biman baruah. But I, like most Rafi as well as Dilip Kumar fans dont agree about your comment about Talat mehmood being the voice of dilip kumar. Even musical meastros 7 directors 7 the entire film fraternity has commented that Rafis voice on dilip kumar “bahut fabti thi”. Exact tone, strength, the pathani accent 7 rubab, all magically created by Mohs Rafi in all dilip kumar songs. Indeed a very good article with lot of research. Many congratulations for a very nice and well-written article. There are many sweet and melodious songs of Rafi Sahab which are picturised on Joy Mukherji (one of my favourite heroes). Following are some songs which are not specifically mentioned in the article. apuni kenekua ? bhal na ki ? yes, rafi sahab is the perfect playback perticularly for shammi kapoor ji, dev anand, joy mukherjee, jitendra, dharmendra, biswajit. this is as similar to that of mukesh jis voice for raj kapoor ji & talat sahab for dilip kumar. here you have not mentioned a very subtle but splendid rendition by rafi sahab for a song of joy mukherjee in the film ziddi with music direction by s.d.burman sahab. the song is ‘ teri surat se , nahin miltee, kiseeki surat, ham jahaan mein, teri tasweer liye phir tein hein. here the scene is joy mukherjee holds a photograph of asha parekh & runs wild without bothering for the passer by. in the running process he hits a fat woman, he falls down & apologises by exclaiming ‘ oh no ‘. in that ‘ oh no ‘ you can never listen to that word ‘ no ‘. its so subtle that unless you keep the volume at very high you cant listen it. you can listen to it in http://www.youtube.com. the word is not audible in cd or tape at normal volume level. there lies the magic of rafi sahab. i am 100 % sure other than rafi sahab no one can creat such a subtle effect, because the voice of rafi sahab was neither husky, nor nasal, nor too feeble. rafi sahab you have created true magic in the world of playback singing which persists for ever like a monument. there is no substitute. you left us & the blank has remained for ever which is making the generations now & hereafter to crave for you. oh the almighty, give back our rafi sahab to us again. « Oh What an evening!